The arrival of 2012 marks two milestones in the studio glass movement: the ninetieth birthday of Harvey Kline Littleton, and the fiftieth anniversary of Littleton’s seminal glassblowing workshops at the Toledo Museum of Art. As a child born to J.T. Littleton—director of research and development at Corning Glass Works and a mastermind behind the invention of Pyrex—young Harvey grew up hearing much ado about glass. Even a simple bowl of jello prompted vitreous abstractions at the dinner table, as J.T. methodically divided and dissected the gelatin to illustrate how glass can shatter and break. Biographer Joan Falconer Byrd first encountered Littleton when she enrolled in his early 1960s glassblowing workshop at the University of Wisconsin, and her decades of association with the artist offer an intriguing glimpse of what has truly been a “life in glass.” Beyond Littleton’s honored and exhibited professional career, we learn of his service in World War II, his marriage to Hawaiian painting student Bess Tamura, the conflicts with his science-minded father, and, of course, Littleton’s quest to manifest creative visions. 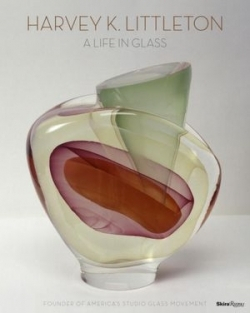 Fortunately, many of Littleton’s visions were made manifest, as seen in the book’s beautiful color photographs of the artist’s glass and ceramic pieces and their collective development over the years. communicate it to us all.